Jim Crow laws were state and local laws that enforced racial segregation in the Southern United States. Enacted by white Democrat-dominated state legislatures after the Reconstruction period, in the late 19th century, the laws were enforced until 1965. In practice, Jim Crow laws mandated racial segregation in all public facilities in the states of the former Confederate States of America, starting in the 1870s and 1880s, and were upheld in 1896, by the U.S. Supreme Court’s “separate but equal” legal doctrine for African Americans, established with the court’s decision in the case of Plessy vs. Ferguson. Moreover, public education had essentially been segregated since its establishment in most of the South, after the Civil War (1861–65). The legal principle of “separate, but equal” racial segregation was extended to public facilities and transportation, including the coaches of interstate trains and buses. Facilities for African Americans were consistently inferior and underfunded, compared to the facilities for white Americans; sometimes there were no black facilities. As a body of law, Jim Crow institutionalized economic, educational, and social disadvantages for African Americans. Legalized racial segregation principally existed in the Southern states, while Northern racial segregation generally was a matter of fact — enforced in housing with private covenants in leases, bank lending-practices, and employment-preference discrimination, including labor-union practices. 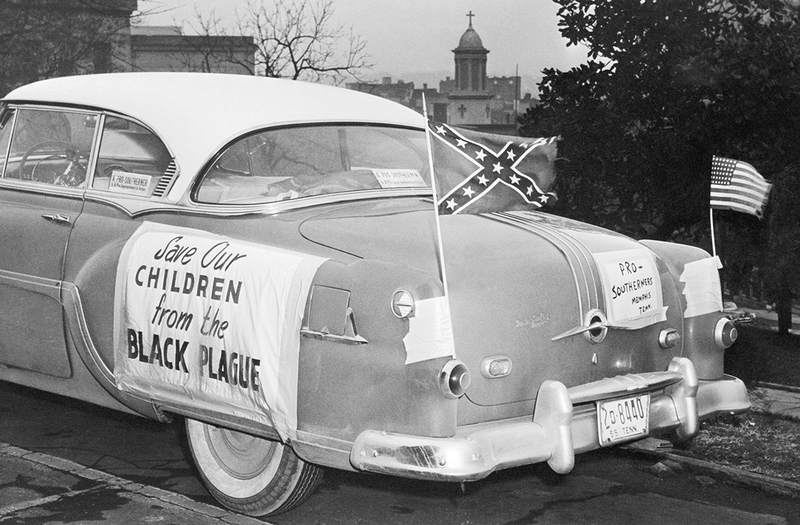 Here in pictures are many of the common sights during what became known as the Jim Crow era. 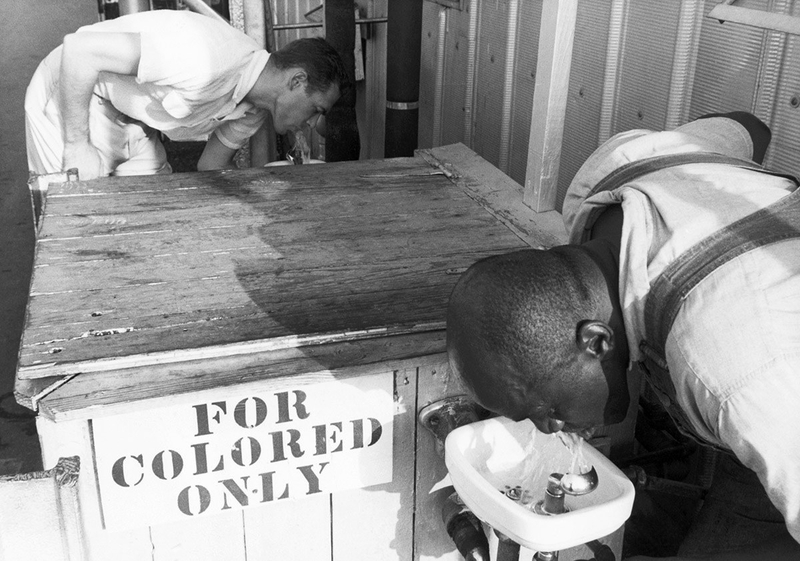 In this undated picture, men drink from segregated water fountains. 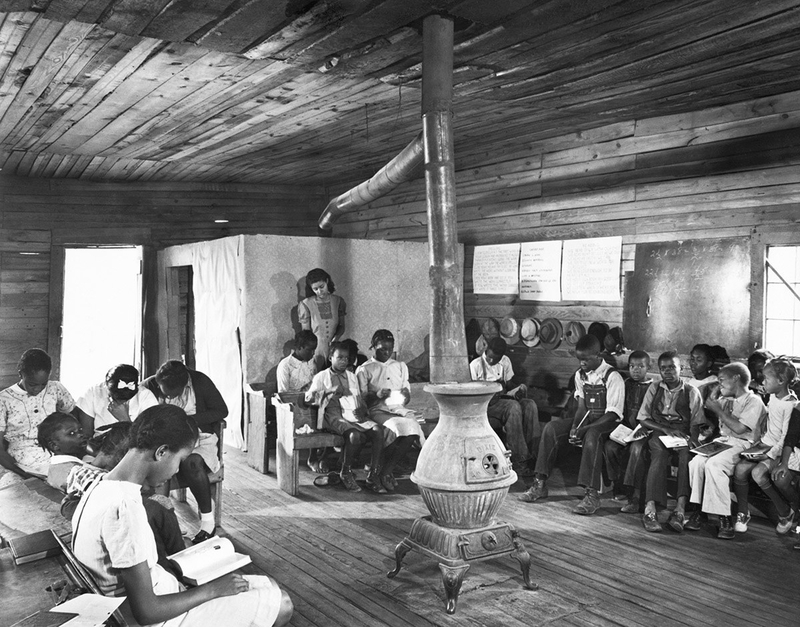 A teacher instructs a segregated class of black students at a poorly funded, one-room school in the backwoods of Georgia in 1941. 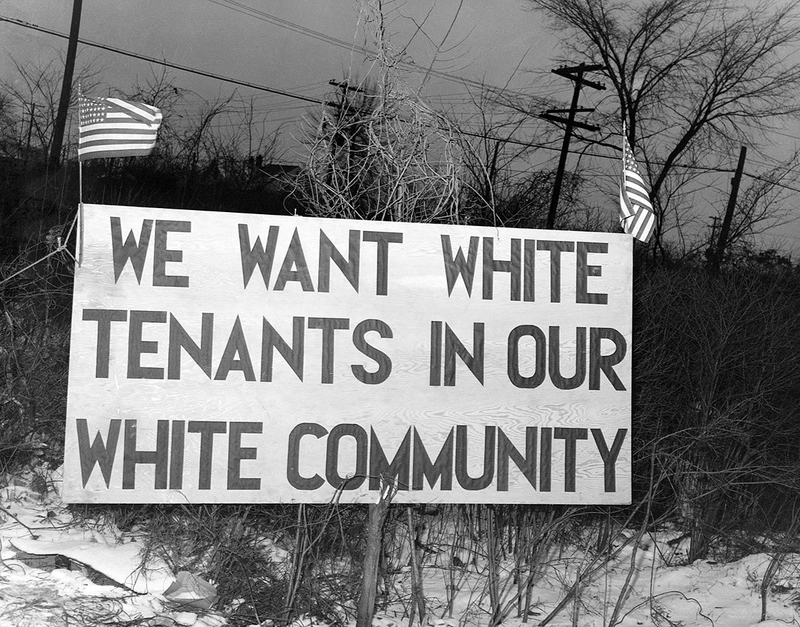 White tenants seeking to prevent black Americans from moving into the Sojourner Truth Homes, a federal governmental housing project, erected this sign in Detroit in 1942. 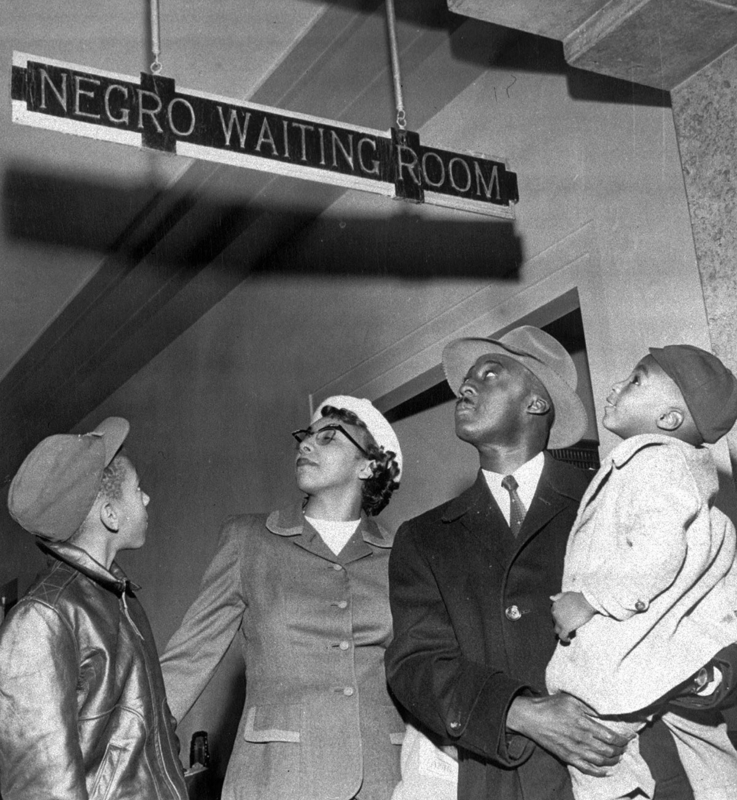 Dr. and Mrs. Charles N. Atkins of Oklahoma City, Oklahoma, and their sons, Edmond, 10, and Charles, 3, pause for a glance at the Santa Fe Depot segregation sign on Nov. 25, 1955. US and Confederate flags fly from a car parked on Tennessee’s Capitol Hill in Nashville, where Gov. Frank Clement met with a delegation of pro-segregationists on Jan. 24, 1956. Clement turned down a bid to lead a fight for continued racial segregation, saying he did not plan to interfere with local authorities and their decisions on such matters.